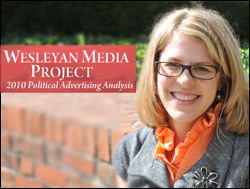 Erika Franklin Fowler, assistant professor of government, is director of The Wesleyan Media Project. The 2010 campaign season was the most negative in recent years, but, current political rhetoric aside, that actually may not be a bad thing. These are among the findings and conclusions from a recent journal article published by Erika Franklin Fowler, assistant professor of government and director of The Wesleyan Media Project, and her co-researchers in The Forum, a Journal of Applied Research in Contemporary Politics. “Advertising Trends in 2010” by Fowler and Travis Ridout, associate professor at Washington State University and co-director of The Wesleyan Media Project, examined the data and trends in television campaign advertising from all Federal and Gubernatorial races during the 2010 cycle. This included such issues as negativity levels and tenor in ads and its effect; the top issues and themes used by Democrats and Republicans in House and Senate ads; and ad tone (Attack, Promote, Contrast) by party from 2000-2010. While the data revealed that the 2010 election produced more negative ads by overall number and percentage of ads run – a strategy that most politicians and political observers believe generates votes – the analysis of what type of negative ads employed by each side provided insight into more specific campaign tactics. The majority of Republican candidates and their support groups attacked their opponents’ policies; the bulk of Democratic candidates and their supporters used ads to make personal attacks on their opponents. These use of attack ads continued an increase that has been steady on both sides since the 2000 election. However, in their conclusion, Fowler and Ridout stated that negative ads were not necessarily a bad thing with regards to elections. “The Citizens United Election? Or Same as it Ever Was?” by Michael Franz, associate professor of government, Bowdoin College, and co-director of The Wesleyan Media Project, examines the data and trends of the 2010 federal and gubernatorial campaigns with respect to the Citizens United vs. Federal Election Commission ruling by the U.S. Supreme Court, which permitted campaign advertising by corporations, unions and outside interest groups. Franz found that, despite widespread apprehension and speculation, the outside groups did not produce the large impact that many had predicted. However, that may not be the case moving forward. According to Franz, “the real effect of Citizens United will probably be seen in 2012 and 2014. The Wesleyan Media Project is a nonpartisan, grant-funded academic initiative established in 2010 to track televised campaign advertising in federal elections. It is supported by grants from John S. and James L. Knight Foundation, The Sunlight Foundation, Wesleyan University, and its partner institutions Bowdoin College and Washington State University.